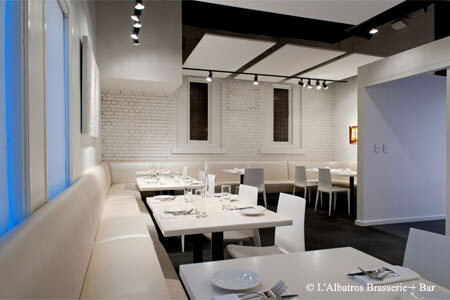 L’Albatros serves French cuisine, tinged with contemporary American sensibilities. : Chef/owner Zack Bruell --- known for Parallax Restaurant & Lounge, Table 45 and Chinato --- is behind Cleveland’s most authentic French concept, located in University Circle. With a well-crafted menu of classic dishes, alongside whimsical interpretations of more contemporary fare, L'Albatros is a destination for any foodie. Start with the french toast, which features a savory ragoût of wild mushrooms and balsamic syrup, or the goat cheese tart. Don’t miss the selection of cheeses, chosen monthly by the restaurant’s fromager. For an entrée, the duck confit is a delectable choice. Ditto for the roasted cod served with spätzle and sauerkraut and topped with crème fraîche. Desserts are equally classic; try the honey-almond cake served with macerated strawberries. The beverage menu is on par with the fare and features a number of alcoholic and non-alcoholic concoctions. There's also an extensive, thoughtful beer and wine list (many vinos are available by the pour) to round out the experience. Servers are intuitive and deliberately paced, allowing diners to savor the experience.